Will idiots snub Brian Dawkins and Terrell Owens for the Hall of Fame again in 2018? John Lynch can't hold Brian Dawkins' jock. On Saturday, the NFL will announce the next five players entering the Hall of Fame. 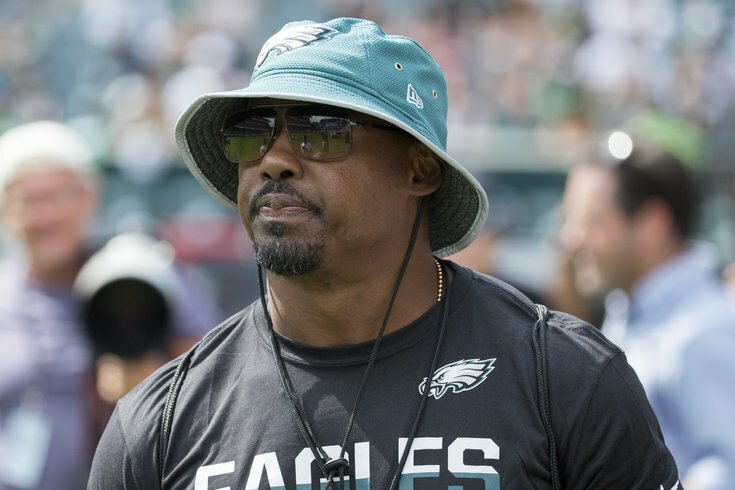 This time last year, former Eagles safety Brian Dawkins and former Eagles wide receiver Terrell Owens were passed over for a kicker, laughably. Statistically, there is no argument whatsoever not to vote for Dawkins and Owens. None. A year ago, somehow there were people who voted for former Buccaneers safety John Lynch, but not Dawkins. Lynch, quite frankly, couldn't hold Dawkins' jock. Neither player got in, but Lynch hurt Dawkins' candidacy because he siphoned off a chunk of the dolt vote. On the intangible side, both players were leaders, although there has probably never been a more respected leader in Philadelphia professional sports than Dawkins. At worst, Lynch and Dawkins stalemate there. As you can see, over their careers, Dawkins had twice as many sacks, twice as many forced fumbles (and then some), twice as many fumble recoveries, 11 more interceptions, and more tackles. There isn't a single statistical category where Lynch was objectively a better football player than Dawkins. Even if you dig deeper into other stats, you won't find any. For example, over his career Lynch had 89 pass breakups, while Dawkins had 175. Or how about tackles for loss? Lynch, know for being an "in the box" safety, should have the advantage there, right? Nope. He averaged 2.3 tackles for loss per season from 2001 on (when the NFL began tracking that stat). Dawkins averaged 3.2. Lynch had zero career touchdowns. Dawkins had four. I could continue. It seems the only arguments that can be made for Lynch are that he (A) played for a team that won a Super Bowl, and (B) retired sooner than Dawkins. Both of those arguments are moronic. Yes, Lynch won a Super Bowl with the Bucs. And that's terrific for him. Of course, he played alongside Warren Sapp, Derrick Brooks, Simeon Rice, and Ronde Barber, but who's counting? I'll also add that it's not as if Lynch was a huge factor in that Super Bowl run. He had 10 tackles (one in the Super Bowl) in three games that postseason, with no forced fumbles, fumble recoveries, or interceptions. Meanwhile, the other safety, Dexter Jackson, took home MVP honors. I'm quite sure that if the Bucs employed Dawkins instead of Lynch, that defense would have been even better. It certainly would not have impeded the Bucs from winning the Super Bowl. Again, Dawkins had a far bigger impact across the board. There's this notion that Lynch should get in the Hall of Fame before Dawkins because that's the order in which they retired. That is so idiotic it's mind blowing. If two players are close, then yeah, sure, maybe the tie should go to the guy who's been waiting longer. But when it's as completely lopsided as we've spelled out above, there's really no justification whatsoever for voting for Lynch over Dawkins. He was second in tackles, second in sacks, first by a mile in forced fumbles, first in fumble recoveries, and second in interceptions, but way behind Ed Reed in the interception department. And you know what? Just for fun, let's throw Chicago Bears linebacker Brian Urlacher into the mix, as this is now his first year of eligibility as well. Dawkins had 37 forced fumbles vs. 11 for Urlacher. Eleven! As a 13-year linebacker! Not to mention, you know, more tackles and 15 more interceptions. Anyway, long story short, if you vote for John Lynch or Brian Urlacher, but you don't vote for Brian Dawkins, you lack logic, intelligence, you don't know jack about football, and shouldn't have a vote. Hmmmm, where should we start? His stats, I guess, right? • Terrell Owens has the second-most receiving yards in NFL history. • Terrell Owens has the eighth-most receptions in NFL history. • Terrell Owens has the third-most receiving touchdowns in NFL history. Terrell Owens, statistically, is very clearly as worthy a Hall of Famer as any receiver in NFL history not named Jerry Rice. He did not get in last year because of his attitude and off-field persona. Appearing on NFL Network last year, Hall of Fame president David Baker explained whether or not character should be factored in by voters or not. "I wish everyone last year could have seen that discussion, and everything is confidential that happens in there," Baker said. "It’s up to each voter. Our bylaws say that it’s only what happens on the field. But is ‘in the locker room’ part of the field? Is leadership part of the field?" It sounds a lot to me like voting, as stated by the bylaws, should be limited to on-field play, but voters who simply don't like Owens have added in whatever necessary to keep him out. We'll call it the "You Can't Triple Stamp a Double Stamp" corollary. Anyway, this year, Randy Moss is up for induction, and his career very closely resembles Owens'. Both players had amazing talent. Both players had teams want them off their rosters despite that amazing talent. Both players finished their careers without a Super Bowl win, and both players put up incredible numbers. It will be interesting to see if Moss gets in, but Owens does not. As noted above, a kicker, Morten Andersen, got in over Dawkins and Owens in 2017. I'm not opposed to a great kicker getting in, however, over his career, playing 22 seasons in a dome, Andersen connected on 79.7 percent of his field goal attempts. If Andersen played in 2017 and maintained his career average, he would have been the 26th most accurate kicker in the league last season. In other words, don't expect much in the way of logic, intelligence, or football IQ to factor into Hall of Fame voting.